2018 Honda CRF50F. Picture credits - Honda. Submit more pictures. Getting the right start makes all the difference in life: eating the right food, going to the right school, learning the right lessons, establishing the right values. It�s no different when it comes to motorcycling. Starting a rider off early introduces them to something they can enjoy forever. And starting them off right pays dividends for decades to come. Comments: Model id: CRF50F. Adjustable throttle limiter. 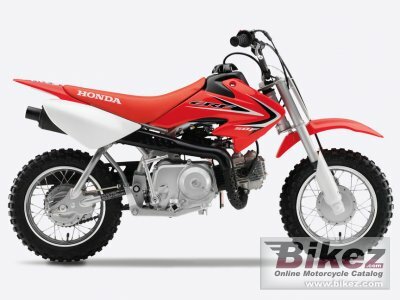 Ask questions Join the 18 Honda CRF50F discussion group or the general Honda discussion group. Bikez has discussion forums for every moped. View comments, questions and answers at the 2018 Honda CRF50F discussion group. You can sign up for e-mail notifications when other riders answer you. If you have extensive experience with the MC, please send us a review. If you consider buying this bike, you should view the list of related motorbikes Look at photos. Compare technical specs. And check out the rating of the moped's engine performance, reliability, repair costs, etc. You can compare the rating with other bikes.